Grow tents are special, fully closed and light-tight tents to grow your own herbs or plants indoors. They too can be an ideal solution when you have little space, or prefer a more temporary and portable way of growing your plants. 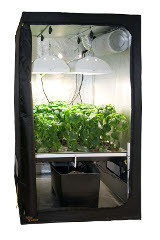 Most important, grow tents are equipped with suspension rods to attach your own LED or other lightsource, and can easily be fitted with an automated hydroponics growsystem as well. Grow tents offer an affordable and efficient way to start your indoor gardening experience at any location. Gorilla Grow Tents are professionally designed growtents that are ideal for experts and perfect for beginners who wants to start growing plants.